Since early December there have been violent protests and criminal acts taking place in Northern Ireland as a result of Belfast City Council’s decision to change their policy on the flying of the Union Flag over Belfast City Hall. Previously, the flag was flown every day, but the new policy is for it to be flown only on a number of designated days a year. Until fairly recently, the policy for many government buildings throughout the UK was for the flag to be flown only on these flag-flying days: dates such as the Queen’s birthday, or the anniversary of Her Majesty’s accession to the throne – hardly key dates in the Republican calendar, one would have thought; yet with their agreement it is on these days that the flag will now be flown in Belfast. A few years ago, the UK government did announce that government departments could fly the flag all year round if they so chose, but many still stick to the old schedule. Indeed, the government-owned site where I work flies the Union Flag on those selected days. Because it isn’t flown every day, people tend to notice it when it is flown, and comment on it. It can be fun to try and figure out what anniversary is being marked. I actually find the idea of flying a national flag continuously to be quite a foreign concept. If you visit cities on mainland Europe, they are often covered in flags. It’s all very pretty, but it just isn’t the British way of doing things. Only at British embassies in foreign cities can you be sure of seeing the Union Flag flown every day, and I doubt that’s the effect the protesters in Belfast are hoping to achieve. One particularly sad aspect of the violence when it began in December was that the homes and offices of politicians belonging to the non-sectarian Alliance Party were targeted in particular. As they hold the balance of power between the Republicans/Nationalists and Loyalists/Unionists on Belfast City Council, some people saw the decision as their “fault”. 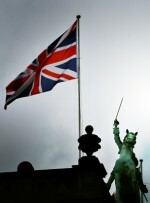 Yet the original proposal tabled had been for the Union Flag not be to flown at all. The Alliance Party had suggested using the traditional UK flag flying days as a compromise, which was then approved in a vote. It would be easy for people in Northern Ireland to say that those of us outside the Province should mind our own business, and that outsiders simply do not understand the issues that exist there. Yet the fact is the “Loyalists” claim to loyal to be British Crown, and are protesting over the right to fly the British flag. And as the violence has escalated, it is British police officers that have come under attack. That’s not a sort of Britishness many would recognise in any other part of the United Kingdom. Being British isn’t about flying flags every day or marching with banners and symbols. It’s about shared values including being tolerant of others, fair play, and showing respect for civic institutions such as the police or democratically elected councillors. If people in Northern Ireland wish to be British, then as someone who wholeheartedly supports the existence of the United Kingdom I am perfectly happy with that. But if they instead wish to pursue their own brand of Ulster Loyalism, most British people would prefer they found their own flag to march under.